Kick off your visit on the 25th (Thu): discover the deep blue sea with a scuba or snorkeling tour and then get interesting insight from Tours. Plan my day in Crystal River using traveler tips and tourist information provided by Inspirock. Tehran, Iran to Crystal River is an approximately 28-hour flight. The time zone changes from Iran Standard Time to Eastern Standard Time, which is usually a -8 hour difference. Traveling from Tehran in April, expect nights in Crystal River to be about the same, around 17°C, while days are somewhat warmer, around 32°C. Finish up your sightseeing early on the 25th (Thu) so you can go by car to Marco Island. Marco Island is a city in Collier County, Florida, United States, located on an island by the same name in the Gulf of Mexico off the coast of Southwest Florida. Kick off your visit on the 26th (Fri): identify plant and animal life at Wildlife Areas and then get up close to creatures of the deep with a dolphin and whale watching tour. Get ready for a full day of sightseeing on the next day: enjoy the sand and surf at South Marco Beach, get a new perspective on things with Boat Tours & Water Sports, and then get some thrills out on the water with a waterskiing or jet-skiing adventure. To find traveler tips, where to stay, other places to visit, and more tourist information, refer to the Marco Island trip maker tool . Traveling by car from Crystal River to Marco Island takes 4.5 hours. Alternatively, you can take a bus; or take a bus. Traveling from Crystal River in April, expect somewhat warmer with lows of 22°C in Marco Island. Finish your sightseeing early on the 27th (Sat) so you can drive to Marathon. 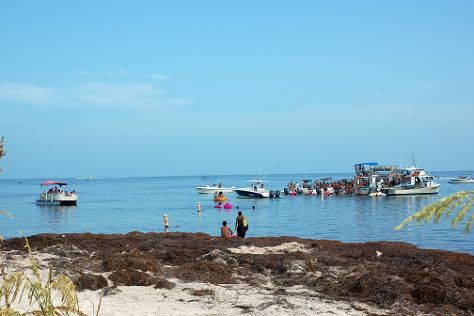 Kick off your visit on the 28th (Sun): enjoy the sand and surf at Sombrero Beach, look for all kinds of wild species at The Turtle Hospital, and then admire the majestic nature at Bahia Honda State Park. To see reviews and more tourist information, refer to the Marathon road trip planning site . Traveling by car from Marco Island to Marathon takes 4 hours. Alternatively, you can do a combination of ferry and bus; or do a combination of bus and flight. Traveling from Marco Island in April, you can expect nighttime temperatures to be somewhat warmer in Marathon, with lows of 28°C. Finish your sightseeing early on the 28th (Sun) to allow enough time to take a bus to Key West. Kick off your visit on the 29th (Mon): see majestic marine mammals with a dolphin and whale watching tour. To find where to stay, more things to do, other places to visit, and tourist information, use the Key West tour planner . You can take a bus from Marathon to Key West in 1.5 hours. Alternatively, you can drive. In April, plan for daily highs up to 33°C, and evening lows to 27°C. Wrap up your sightseeing by early afternoon on the 29th (Mon) to allow time for travel back home.